Johannes Gehrts (1855–1921), Armin Bids Goodbye to Thusnelda (1884), oil, dimensions not known, Lippisches Landesmuseum Detmold, Detmold, Germany. Wikimedia Commons. Sometimes you have to dig around a bit to understand what is going on in a painting, particularly some of JMW Turner’s. Here, my puzzle is The Opening of the Wallhalla, 1842 (1843), which shows a classical building resembling the Parthenon in Athens, and a huge crowd of people gathered on the opposite bank of the river below it. Valhalla is, of course, the mythical majestic hall to which half of the Vikings went when they died in battle, in preparation for Ragnarök. The Walhalla (to spell it correctly) which Turner shows is a very long way from the lands of the Vikings, and was the product of German nationalism, not Viking myth. It is a large neo-classical building above the River Danube, just to the east of Regensburg in Bavaria, Germany, which celebrates the great figures of German history, from Arminius, the leader of Germanic tribes who defeated the Roman army at the Battle of Teutoburg Forest in 9 CE, to the poet Goethe. Leo von Klenze (1784-1864) (architect), (German Victory under Arminius in the Battle of Teutoburg Forest) (c 1842), stone pediment freeze on the north side of Walhalla, Donaustauf, Bavaria, Germany. Image by Brego, via Wikimedia Commons. On the north side of Walhalla, a pediment frieze shows the victory of the Germanic tribes led by Arminius. Crown Prince Ludwig of Bavaria commissioned Walhalla as a memorial to the great figures of German history. Since its inauguration, the monument has been a focal point of nationalism. Most recently, though, pride of place has been given to those who opposed the Nazis, including a bust of Sophie Scholl, a student who was executed in 1943 for her non-violent opposition to Hitler’s regime. Walhalla is almost at the opposite end of Germany from the site of the Battle of Teutoburg Forest, which has its own memorials, around Bielefeld, at the northern edge of the central uplands, on the border between Lower Saxony and North Rhine-Westphalia. 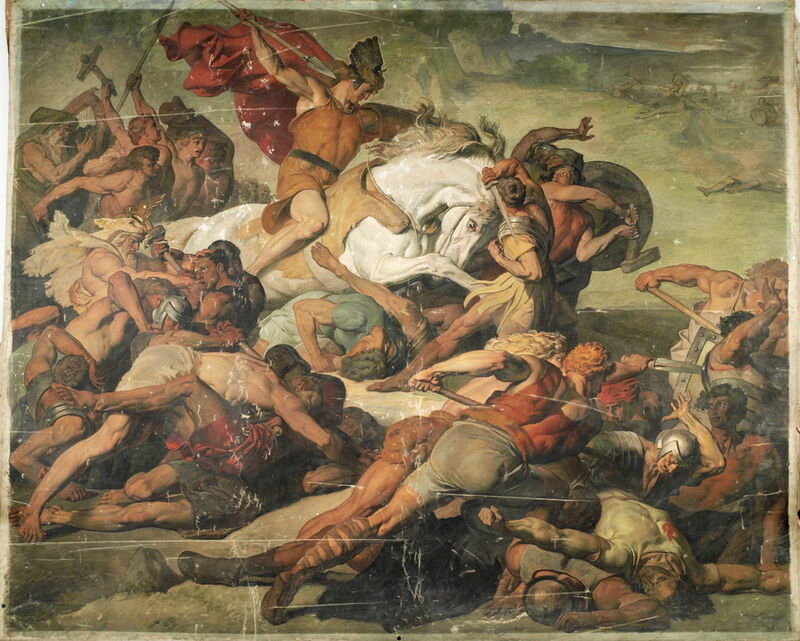 At the time, the battle was a military disaster for the Romans, and a singular triumph for the Germanic tribes. But it was also one of the key events leading to what we now know as Europe. The battle, recorded in detail by Roman historians Tacitus (c 56-120 CE) and Cassius Dio (155-235 CE), became forgotten in time, and interest in it was not revived until the Renaissance. Amazingly, the site of the battle was only rediscovered in 1987, and excavated from 1989. The Battle of Teutoburg Forest and its hero Arminius have been painted occasionally, most recently in a German nationalist context. Arminius’ name was abbreviated to Armin, and mistranslated as Hermann; he is sometimes therefore known humorously as Hermann the German. Johann Heinrich Tischbein (1722–1789), Hermann’s Triumph after Victory over Varus (1758), oil on canvas, 65 x 83 cm, Museum im Schloss Bad Pyrmont, Germany. Wikimedia Commons. Johann Heinrich Tischbein, the Elder or Kasseler Tischbein, appears to have initiated this nationalist theme, in his Hermann’s Triumph after Victory over Varus (1758). This show’s Arminius’ Germanic tribesmen gathering after the defeat of the Romans, at the edge of the forest. A rather effeminate and pudgy Arminius stands, displaying the armour and distinctive red toga of the dead Roman leader, Publius Quinctilius Varus. To the right, tribesmen carry the captured ‘eagles’ of the three Roman legions which were wiped out in the battle, and others sort through captured booty. The reality was a slaughter which would have shocked even Goya. Surviving Roman soldiers were mutilated, executed, and some apparently cooked in large pots; others were taken into captivity. One group of Roman prisoners was not liberated until Publius Pomponius Secundus attacked bands of Chatti forty years later. At least half of the Roman forces of 20,000-36,000 were killed, and the Romans were unable to bury those dead for six years. When the Roman emperor Augustus heard of the catastrophic defeat, he is recorded as shouting repeatedly Quinctilius Varus, give me back my legions! while butting his head against the wall. It remains one of the most decisive battles in recorded military history. Johann Heinrich Wilhelm Tischbein (1751–1829), Hermann and Thusnelda (1822), oil, dimensions not known, location not known. Wikimedia Commons. 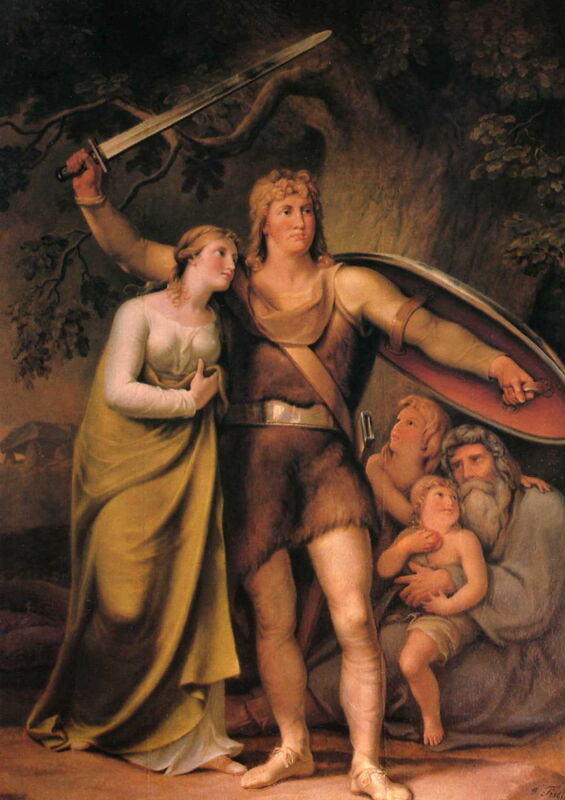 Johann Heinrich Wilhelm Tischbein, or Goethe Tischbein, chose to contribute to the new myth which was building, in his painting of Hermann and Thusnelda (1822). This conveniently ignores the little that we know of the couple. According to Tacitus, Thusnelda was the daughter of a pro-Roman tribal leader, who was abducted and made pregnant by Arminius in about 14 CE, five years after the Battle of Teutoburg Forest. By the following year, she had returned to her father, when she was captured by Roman forces and taken to Rome, where her son Thumelicus eventually became a gladiator. Karl von Piloty (1826–1886), Thusnelda in the Triumphal Procession of Germanicus (1873), oil on canvas, 490 × 710 cm, Neue Pinakothek, Munich, Germany. Wikimedia Commons. 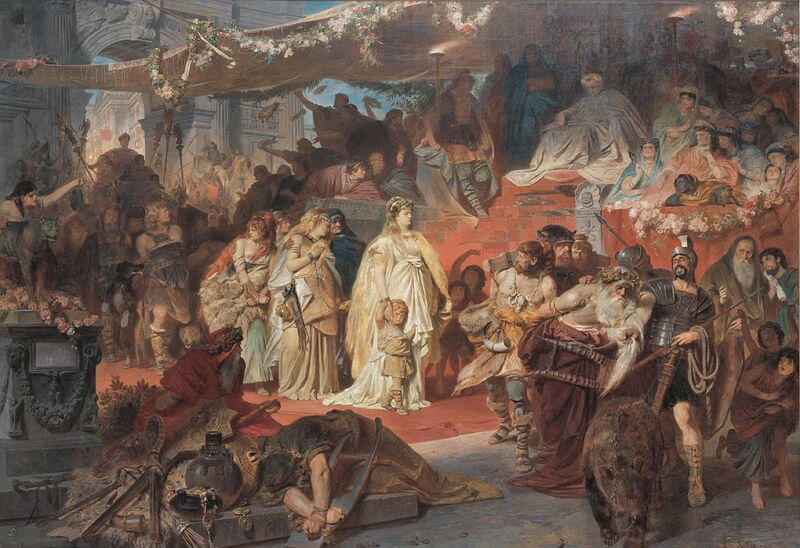 Karl von Piloty’s vast Thusnelda in the Triumphal Procession of Germanicus (1873) is a more accurate artistic invention. It shows Thusnelda and her young son Thumelicus being paraded past the emperor Tiberius during the triumph celebrating Germanicus’ victory over the tribes in 15 CE; this triumph took place in Rome on 26 May, 17 CE, although Thumelicus would only have been two years old at that time. Von Piloty appears to have been one of the few prepared to portray the more bitter truth of recorded history, instead of nationalistic myth. Johannes Gehrts, though, preferred to elaborate the new myth, in his Armin Bids Goodbye to Thusnelda (1884). This is presumably intended to show Arminius leaving the princess on his way to the Battle of Teutoburg Forest in 9 CE, five years before he abducted her. 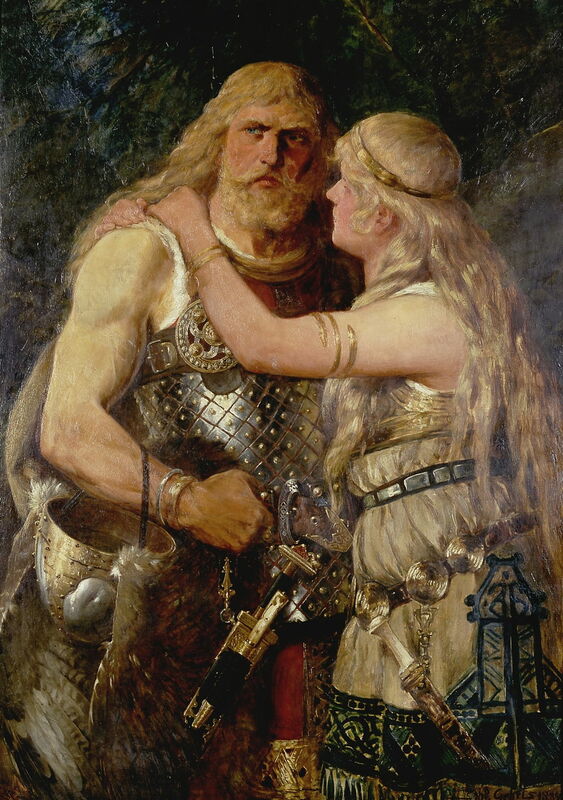 The couple are shown with the blonde hair and fair complexions claimed to be characteristic of Germanic peoples, and could easily have stepped out of a Wagner opera. Friedrich Gunkel (1819-1876), Hermann’s Battle (1864), colour reproduction of oil painting in Maximilianeum Munich, destroyed in World War 2, further details not known. Wikimedia Commons. 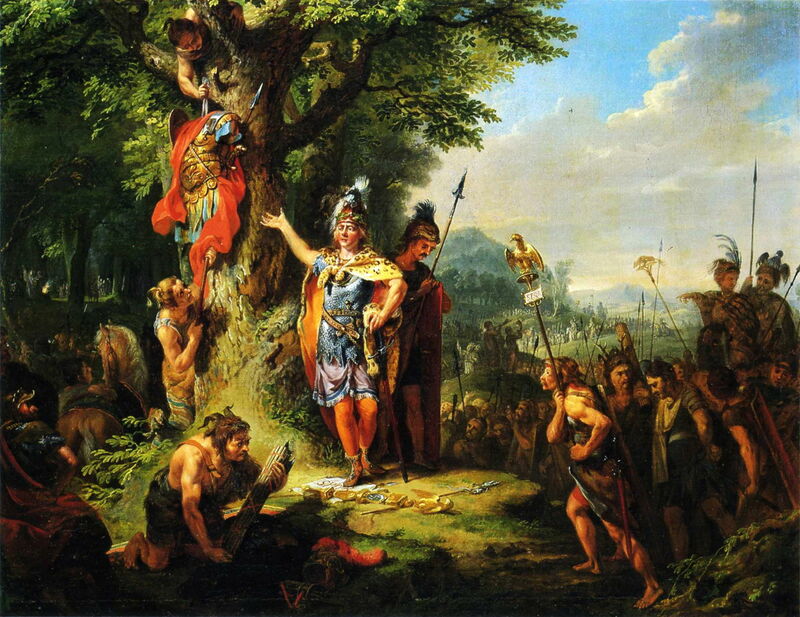 Paintings which purport to show the Battle of Teutoburg Forest became similarly rich in stereotypes. Friedrich Gunkel’s Hermann’s Battle (1864) shows Arminius mounted on a white charger, leading his tribesmen from the front. In the middle distance, Roman archers are shown, although accounts report that they were unable to use their bows because the very wet conditions made their sinew strings too slack. Peter Janssen (1844–1908), The Victorious Hermann (1870-73), oil, dimensions not known, Kunstmuseen Krefeld, Krefeld, Germany. Wikimedia Commons. Peter Janssen’s painting of The Victorious Hermann (1870-73) closes in on the hero, again on a white charger, but here without any armour. 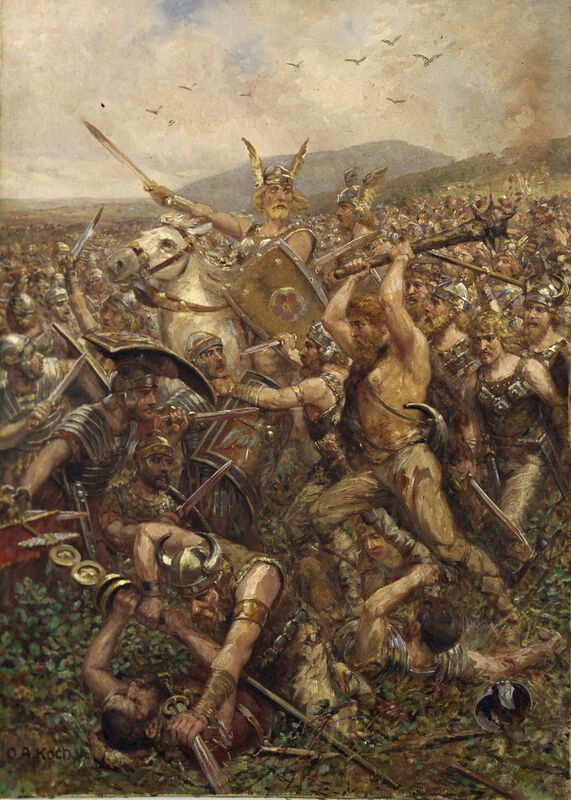 Otto Albert Koch (1866–1920), Varus’ Battle (1909), oil, dimensions not known, Lippisches Landesmuseum Detmold, Detmold, Germany. Wikimedia Commons. 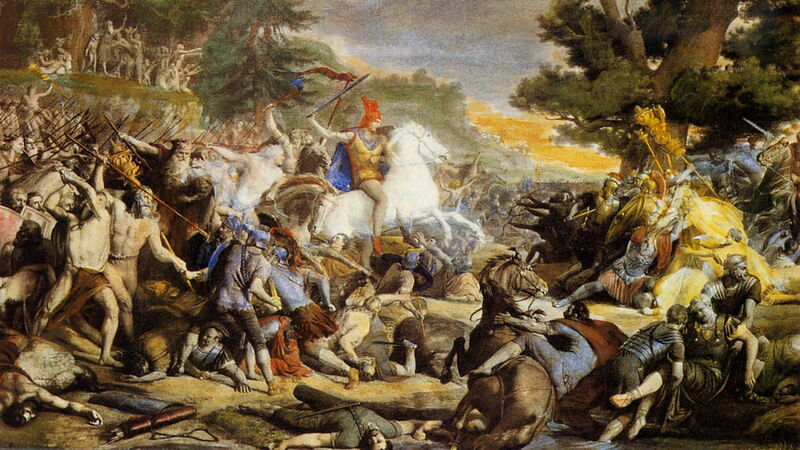 Otto Albert Koch’s later painting of Varus’ Battle (1909), which coincided with rising German nationalism prior to the outbreak of the First World War, also seats Arminius on a white charger, which here is the only horse in sight. In the foreground, a Norse fighter, whose helmet bears the horns distinctive of a stereotypical Viking, is wresting one of the Roman eagles from the hands of a dying Roman soldier. For the Germanic tribes, this resounding victory bought a little respite from the Romans, but did not deter them for long. It brought a more political and diplomatic approach, in which there was progressive Romanisation outside the bounds of the empire. Far more important, and of much greater long term consequence, was the effect on the development of Europe beyond the Roman Empire. Map of Germania Magna in 7-9 AD, showing the location of the Battle of Teutoburg Forest. By Cristiano64, via Wikimedia Commons. 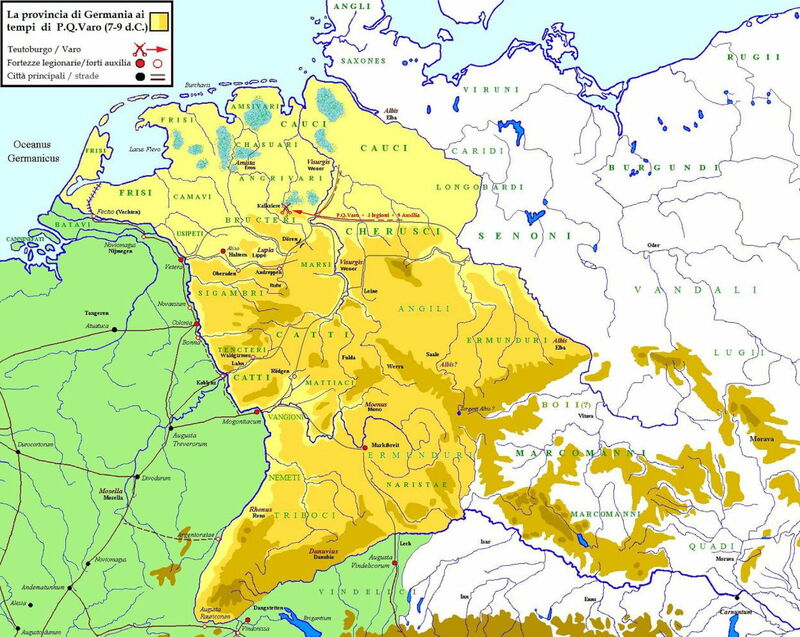 This map of Germania in 7-9 AD shows the location of the Battle of Teutoburg Forest with red crossed swords. To the north of the forest were the Angles and Saxons, many of whom later invaded England and displaced Celts, who themselves invaded the British Isles prior to the more northerly peoples. Further to the north were the Scandinavian peoples, who flourished in co-operation with the less invasive Romans. This in turn enabled them to launch raids on, then settle in, coastal areas of the British Isles, and extend to Iceland, Greenland, and North America. With those Vikings came sophisticated boat technology, which turned the early farmers of northern Europe into seafarers, who traded and travelled far and wide. The defeat of the Romans in the Battle of Teutoburg Forest thus enabled Europe to start the processes which transformed the continent from Roman territories to the Europe which we know today. It is not about some imaginary German nation, but about the whole of northern Europe. 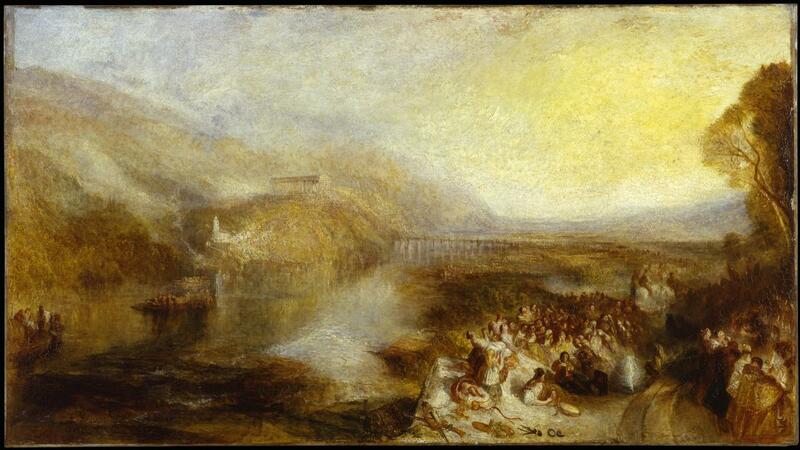 I doubt whether Turner knew any of this, but in a way, his painting may reflect that history. Angleo Forte, Richard Oram, and Frederik Pedersen (2005) Viking Empires, Cambridge UP. ISBN 978 0 521 82992 2. Posted in General, Life, Painting and tagged Arminius, Gehrts, Gunkel, Janssen, Koch, narrative, painting, Teutoburg Forest, Tischbein, Turner, Viking, von Piloty. Bookmark the permalink. Very interesting such history painting being a major theme that painters were to react against. I think there are still major differences below and above the line of Roman occupation. Many thanks for your efforts!